A review of Jeff Lemire and Ramon Perez’ “Hawkeye #5: All New Hawkeye” (Marvel Comics, 2015). As a disability scholar and a fan of Jeff Lemire’s work, I was extremely excited to discover that Lemire had taken on the writing of the Hawkeye comics. Hawkeye has been recently reinvented as a deaf character (I use the small “d” deaf here because Hawkeye doesn’t engage with many aspects of Deaf culture). Rather than using sign language, this Hawkeye uses a powerful hearing aid created by Tony Stark (Iron Man) that allows him to hear. Fortunately, at various points in the comic, Lemire has Hawkeye lose the use of his hearing aid to illustrate his deafness. Hawkeye’s deafness is rendered in Ramon Parez’ illustrations by showing empty speech bubbles, having the reader take the role of Hawkeye in trying to discern what is being said. This is an effective way of conveying Hawkeye’s deafness since the static form of comics doesn’t allow for the movement of lips. Further, the choice not to make Hawkeye capable of reading lips in the midst of battle is an effective one since lip reading is largely not effective when bodies are static let alone during the movement of battle. 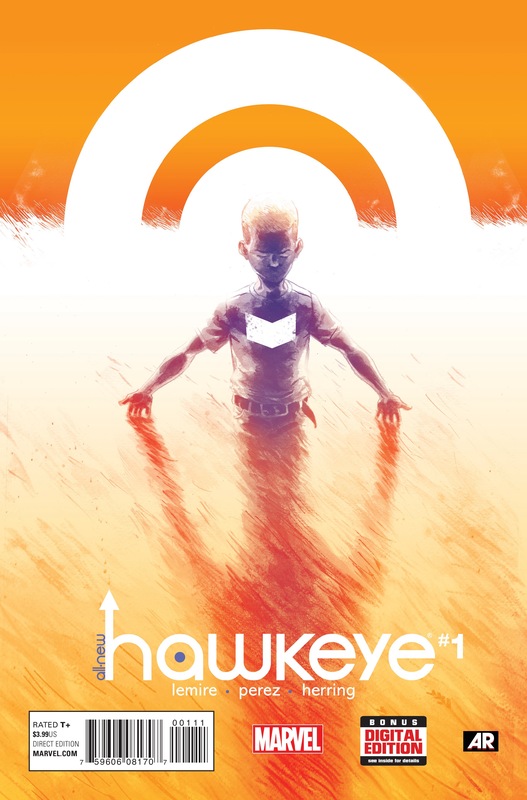 Lemire covers the early life of Hawkeye, illustrating when the character becomes deaf through the abuse of his father. This narrative links Hawkeye’s deafness to his early life and represents the intersection of two bodily identity narratives – the abused person and the deaf person. Lemire resists the temptation of making Deafness into a symbolic medium that many able-bodied authors fall into. Instead, Lemire presents deafness as a bodily experience and one that is only part of the multiplicity of experiences and identities Hawkeye experiences. Lemire avoids the narrative of the “supercrip”, where a character with a disability is given superpowers to compensate for his or her disability (like Daredevil). Instead, Hawkeye has gained his skills through practise and doesn’t have any additional superpowers. The focus on vision for Hawkeye is significant since deafness normally means a focus on vision as the medium of communication and interaction. Indeed, the deaf community has been referred to as the “people of the eye”. The link between vision and Hawkeye’s name, indicating both accuracy, but also a precision of vision makes a firm link between his deafness and his focus on developing his visual skills. In addition to exploring Hawkeye’s deafness, Lemire explores the character’s role as a mentor and the complicated relationship between mentor and mentee, bringing attention to the role of aging that is generally elided in superhero narratives. Hawkeye is shown preparing the next generation of heroes for the future of the role. Lemire’s reference to Hawkeye’s history as a circus performer brings attention to the way that Deaf and disabled people have been involved in the circus industry, finding a place of belonging amongst other people who have been socially discriminated against. This role in the circus plays with the notion of the circus community and the disabled person as both being figures who are stared at in a society that constructs difference as pathological. Lemire examines the way that this intersection shaped Hawkeye’s experiences, propelling him to develop his skills in circus performance (particularly his role as a bowman) that eventually will lead to his role as a superhero. Lemire’s Hawkeye is represented as fundamentally shaped by his history of experiences, illustrated to be a composite of his past and his present understanding of his role as a superhero. To discover more about Jeff Lemire’s work, visit his website at http://jefflemire.wix.com/jefflemire.